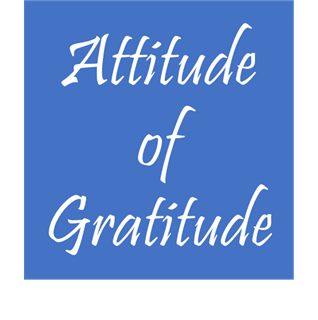 Fostering an Attitude of Gratitude – Notice, Think, Feel, and Do! Thanksgiving reminds me to take stock of the things in my life for which I am most grateful. Of course I am thankful for my family and friends and that I am in good health; I am also thankful that my dishwasher works, that I have hot water whenever I need it, that my husband makes me a cup of coffee each morning as I’m getting ready for work, and that I landed in Boulder with a job that I LOVE to come to each and every day. Growing up, my mother, Mary, was relentless in her drive to instill in me a sense of appreciation. Sometimes it was conveyed through threats that I should stop complaining and eat my dinner because “there are people in the world who are starving!” But mostly it was through our household policy you always say thank you – with my mother emphasizing “say it like you mean it!” As a part of my mother’s rules for instilling appreciation, when I received a gift I could not use it, eat it, spend it, play with it, or wear it until I had written a thank you note. I hated this as a child… and now – looking back – I’m thankful. My mother instilled in me an attitude of gratitude that I am now trying to pass on to my son, Gus. Intentionally teaching gratitude takes time and energy. However, I believe that fostering an attitude of gratitude is worth the work. Studies show that feeling gratitude leads individuals to live happier, more satisfied lives and enjoy increased levels of self-esteem, hope, empathy and optimism. Other studies have shown that kids who practice grateful thinking have more positive attitudes toward school and family. Now, here’s a disclaimer… I am not a perfect parent and Gus is not a perfect child. My house is not all sunshine and roses and encouraging Gus to practice gratitude is especially challenging now that he is a “tween-ager” and his brain is starting to rewire. FYI - During adolescence children’s brains completely rewire. [*insert frustrated emoticon!] I’ll write about this at another time. Be a grateful parent and model thankfulness. This tip makes me think about how important it is to tell the people in our lives how much we appreciate them. I try to do this regularly with my colleagues and friends. However, I sometimes forget to do this with Gus... And, if I am honest, lately I’ve had to work extra hard in this area… because recently he has made some choices that did not reflect his best self. Nonetheless, I am trying to make more of an effort to remember to tell Gus something every day that focuses on why I am grateful for having him in my life, and to model for him how he can begin to do this with others. This morning that effort was as simple as me taking the time to give Gus an extra-long hug before school, while also reminding him that he’s a good person and that I love him. I asked him to think about he how he feels when shows acts kindness or gratitude and to strive for the feeling. Resist the urge to shower your child with too much "stuff." Keep thank you notes on hand and say thank you sincerely and often. The thank you rules that I hated as a child are now a staple in my house. I keep thank you notes on hand and I insist that Gus write a handwritten note of thanks whenever he receives a gift. I also have him occasionally write notes of thanks “just because.” My hope is that someday Gus will pass on this tradition to his own family. Find the silver lining and when you have a choice – take the high-road. This is a strategy that I use at work all the time and I am trying to incorporate it into my parenting. I fully admit that this concept is way easier to talk about with an adult than it is with a pre-teen, often moody, almost 12-year old… That said, if I take the time to find the silver lining and encourage Gus to take the high-road, I can normally find a positive spin for even the most difficult situation. I hope that this effort will help Gus become more resilient and focus on the positives. Taking time to show appreciation grants perspective. Age adds wisdom (thanks, Mom). Each year I become more and more thankful for the life I live, the people who surround me, and the experiences and people that have helped to shape my life. I encourage you to use this Thanksgiving to say thank you to those who have influenced you. Model this with intention as you help your child think about how we can notice, think, feel, and do, to show thankfulness in life. An attitude of gratitude feels good! Happy Thanksgiving! Enjoy time with family and friends.